Luton Town have confirmed that Jonathan Smith, Jake Gray and Josh McQuoid have all been placed on the transfer list. 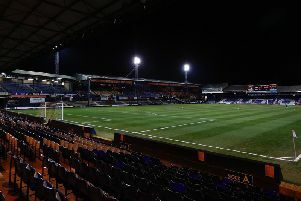 Smith, 30, is the longest-serving player in the current Hatters squad, having made 176 appearances – scoring 11 goals – since arriving from York City in November 2012, 35 of them last season. Gray joined from Crystal Palace last summer and the 21-year-old has scored four times in 28 games, while McQuoid finished the season on loan at Stevenage after making just six starts and two sub appearances up to January. The 27-year-old forward has netted seven goals in 43 games in total since signing following his release by Bournemouth in the summer of 2015. All three have a year to run on their contracts, as boss Nathan Jones told the club’s official website: “We are looking to move the club forward to go one better than the play-offs, so we have to make some tough decisions to enable us to do that. “I have to ask of each player; will they impact the team enough next season? Can I see them helping to take the club forward to where we want to be? We also have to be fair to the players themselves. Will they get enough football? It is best that we make them available for transfer so they can get on with their career at a different club.